Lean Reflections: Girl Scouts ask: How do we inspire girls to enter careers in science or engineering? Girl Scouts ask: How do we inspire girls to enter careers in science or engineering? • Regardless of specific area of STEM, women hold only about 25% of these positions. While Boy Scouts offer merit badges in welding, nuclear science, and other potential career choices as I wrote about in a previous post, Girl Scouts of America are asking the key questions. Not why aren’t girls going into these careers, not what’s wrong with the system, but what do girls want, what really interests them? In short, what’s the customer pull? • 74% of high school girls across the country are interested in STEM. • Girls like the process of learning, asking questions, and problem solving. • Girls want to help people and make a difference in the world. • Girls interested in STEM have supportive adult networks and are exposed to STEM fields. • Girls who are interested in STEM fields are also interested in other subjects and career opportunities. • Girls perceive gender barriers. Girls interested in STEM like to understand how things work (87%), solve problems (85%), do hands-on activities (83%) and ask questions (80%). Two thirds of them like building things, understanding how things are built, and doing math problems. Interest in STEM went along with confidence. Girls interested in STEM believe that they are smart enough to have a career in STEM -- 92%. On the other hand, only 68% of girls not interested in STEM think they’re smart enough. Awareness, family support, and early experience mattered when it comes to building interest in science and technology. 53% of girls interested in STEM know a woman in a STEM career, compared to only 35% who are not interested. Their dads tended to be more interested in STEM than their moms, but were encouraged in that direction by both parents. Fewer girls in the non-STEM interest group had done hands-on science activities when younger, gone to a science museum, or were involved in an extracurricular STEM activity. Girls want to help people and make a difference in the world. They want to have input into how the job is done, make money, think, practice what they love, collaborate, be creative, work with their hands. The reality is that girls said their social influences -- their peers -- aren’t planning for STEM careers. They feel uncomfortable about being the only girl in a group or class, and they think they’d have to work harder than a man just to be taken seriously. Sadly, not much has changed in the decades since women first pushed their way into the STEM workforce. Girl Scouts of America say they reach 2.4 million girls ages 5-17. That’s a conduit that can bypass our educational system that we blame for many of our workforce problems. What can we do? Just as I said you can do with the Boy Scouts, you can extend a helping hand to your local or regional Girl Scout council. Open your doors to tours. Fund trips to museums, robotics competitions, and science camp. Make girls aware of scholarships you offer -- you do offer them, don’t you? Importantly, give women employees the time and support to reach out and mentor girls in your community. Girls need to see themselves as part of the manufacturing and continuous improvement future -- and not as the only girl in the room. 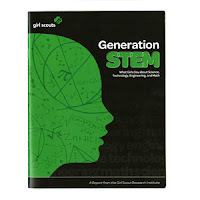 (1) The Generation STEM study LINK was conducted March 2011by the Girl Scout Research Institute. They held eleven focus groups in six geographical areas, which included 140 girls, half of them Girl Scouts, and half with exposure to STEM (after-school, camp, Girl Scout event). They also conducted an online survey a national sample of 852 girls ages 14-17. Lockheed Martin helped support this study. Women also account for > 50% of the STEM degrees today. So those fields that have fewer women (mentioned above) are balanced out by other fields that have fewer men. science, and physics are great fields for a country to build up capacity in to improve long term economic gains. Increasing the number of women in these fields would be great. Historically women have made up much less than 50% of STEM graduates. The workforce transition takes decades. So it will likely be a couple decades before the workforce in STEM fields is > 50% women. Total undergraduate degrees are now about 60% women. So even with men at < 50% of STEM degrees they are still a bit over-represented in those fields compared to all undergraduate degrees (and also underrepresented compared to the overall population). I'll check the data, John. You are right about IT and the advances of women there. In the early 70s when there was an explosion of need for COBOL programmers, women were offered all sorts of opportunities and training in companies. But you still look around at conferences of engineers -- while I'm not the only woman in the room anymore, and the number of them coming into the field is burgeoning, it's still unbalanced. Let's not forget that both women and men without degrees, but the chance to show what they can do on the shop floor are getting new opportunities for leadership. And lean and six sigma lead to training and growth for everyone.